The January 2015 Leo Horoscope forecasts that family and domestic issues will dominate during the month. Profession and career will take a back seat for the Lions. Your efforts will be directed towards finding mental stability in your life and spirituality will be in focus. This month is powerful for social interactions which will be necessary to meet your challenges. You need to be friendly with others in January 2015. Be flexible in order to overcome obstacles with the help of your social contacts. The monthly Leo astrology predictions for January 2015 warn you to reduce your pace of activity and to conserve your energy for the future. You should concentrate on significant objectives and allow other things to pass. Job changes require serious examination. Think twice before beginning any new business. Financial prospects are bright after the first week of the month for the Leo zodiac sign. The hand of your friends and relatives is seen in the inflow of money. Expect a financial windfall from unknown sources in January 2015. Investments and large purchases require proper scrutiny and more caution is necessary when it comes to anything to do with money. Also take a look at what the Chinese horoscope predictions for 2015 have to predict for you. The Leo love astrology forecasts for January 2015 is excellent with many opportunities presenting themselves during the month. Relationship with spouse can go either way. You will be very passionate. There are good chances that you might get regent if you are planning for a baby. You will find love suddenly and probably among friends. Family affairs will see many celebrations and renovation of your home is on the cards. Domestic concerns should be in harmony with other spheres of life. 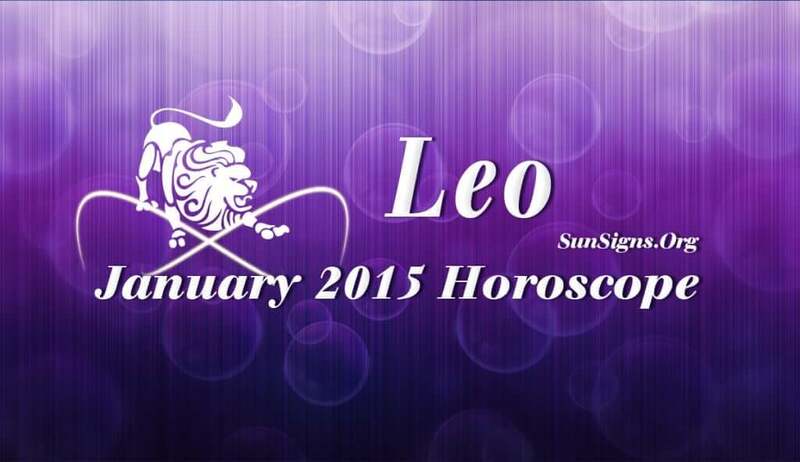 The Leo horoscope January 2015 foretells that your health will remain steady during the month. Take care to relax sufficiently and slow down to avoid stress related problems.